“Below is a list of things I would like to have completed in the next few days which I have proved to myself that, left on my own, I cannot (or will not) do them. And so, I got right to work on a “To Do” list pad — a list of things I don’t wanna do. *Answer: Anybody who has ever lived in or around addiction or alcoholism—that’s who. Does it matter if “I don’t feel like it?” Actually, no—not much. I can take note of it, like, “Oh, look—I don’t much feel like doing that. Isn’t that interesting? I’m going to do it anyway.” Perhaps, like my friend, I have to admit I can’t do it—at least not alone. Perhaps I have to face something worse than procrastination: isolation. So, just for today, I’m can..
1. 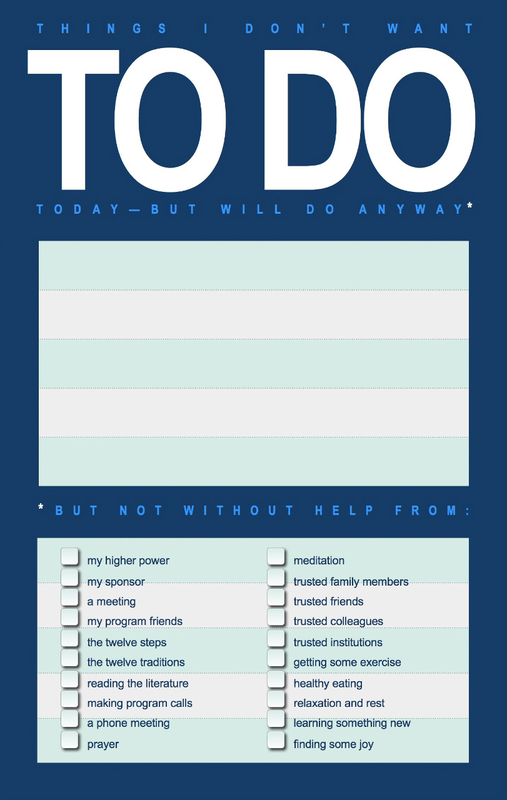 Make a “To Do” list of things (research suggests 3 to 5 maximum**) I may not feel like doing today, but want to have done. 2. Start each item with “I don’t feel like ______” and fill in the blank. 3. Ask myself where I can find the help to get it done. 4. Go to the source, ask for the help. 5. Then, do the thing—whether I feel like it or not. 6. When its done, be grateful and celebrate! Very important last step there! Once it’s done, I can make a very big deal out of how wonderful that is. You know, tear off my coat. Go running down Main Street like the village idiot. Scream out “I balanced my checkbook! !” or “I wrote the stinkin’ report! !” or “Even though it scared the crap out of me, I told the truth!! !” or “I told my sister to mind her own business!” or whatever. I know that people will be leaning out of their windows, showering me with flowers, chanting “Go! Go! Go! Go!” Grandparents at red lights will lean down and whisper to their grandchildren, “There goes the guy who did the right thing TODAY.” YAAY!!! ** PS Productivity research indicates that the average person’s “To-Do” list contains 12 to 15 items. The same research indicates that most people accomplish on average about three (3) of those items per day.